So this is another gadget I’ve been debating on trying out. I canceled my cable last summer since there’s really nothing on over the summer. I bought an HD antenna so I could pick up local news stations which covered nearly all the shows we watch. The biggest gap was sports events covered on ESPN, ESPN2, Fox Sports, etc. I figured I could spend the summer looking for a better solution than paying $80/month for cable just to get a few channels. I soon discovered that nearly all games were broadcast over the Internet. Most games were offered by several sources which is important since some broadcasts are streamed at a low resolution. ESPN3.com is one of my favorites since it’s usually very good quality and covers a variety of games. So now that I’ve found a way to watch everything I want, I’m looking for an easy way to display it on my TV. I waited for the new Apple TV to come out to see what features it offered. It connects to your home network so you can access media, but you’re limited to what content you can watch. Obviously, you could rent or buy from iTunes, but that’s not something I do very often. You aren’t able to display any videos from the Internet unless there’s an app specifically for the site. It’s$99 which is a great deal, but I’d probably only use it for Netflix. The Internet gives you the freedom to watch what you want, and the power to choose what you want to pay for. It’s awesome. What’s not awesome about the internet: no big screen, no HD, no home theater experience, no easy interface designed to sift through the mountains of TV shows, Movies, and content available online. And the real killer: no remote. 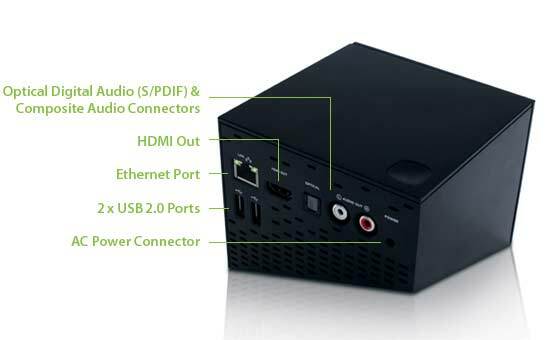 If only there was a little box that brought the freedom of the Internet to your HDTV in stunning 1080p, Dolby Surround Sound, and had a slick interface to simplify everything and – wait for it, a remote to put it all at the tips of your fingers. Too bad nobody has thought of that yet. Oh wait, we did. Haha! Ahem – The Boxee Box, by D-Link, featuring our ingenious two-faced remote. 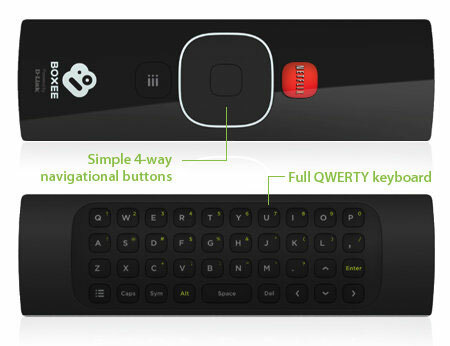 Say goodbye to hunting and pecking for letters on screen, the Boxee Box remote comes with a full QWERTY keypad – as soon as you start typing Boxee Box’s autosearch function starts finding. 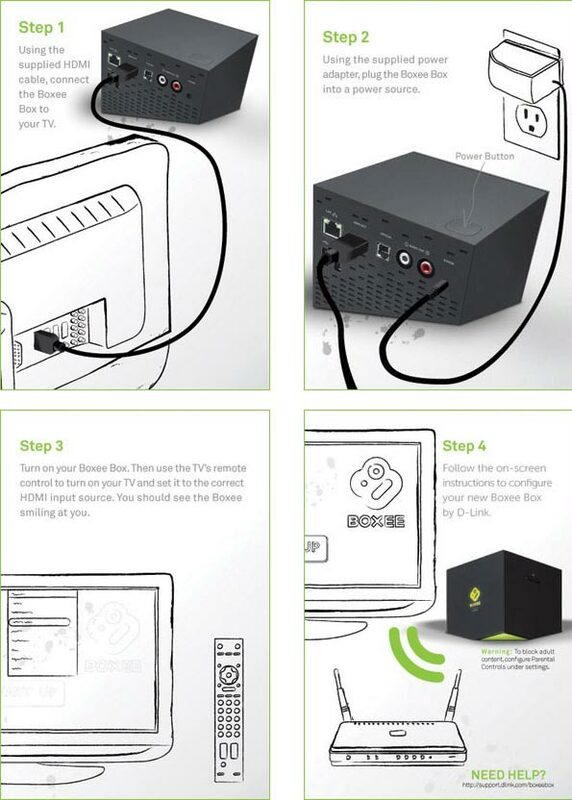 Setting up your Boxee Box is a cinch. Plug your Boxee Box into the wall, connect it to your TV’s HDMI input and turn your Boxee Box on. Oh, please turn on your TV too, thanks. Make sure your TV is getting the signal from its HDMI input – if it is, you’ll see Boxee smiling at you :). Grab the remote and follow the on-screen instructions – that’s it! 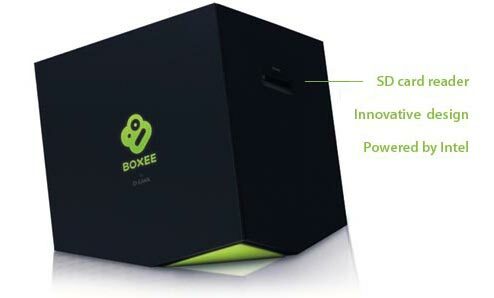 Boxee Box will automatically configure your internet connection, tune itself to your home entertainment system, and get you up and running in a flash. Already a Boxee user? Schweet!! Boxee Box will automatically start importing your account. See! It is a No Biggie!! More of a visual person? Click here.